These are from a party I catered. This are the best things for cocktail parties- super versatile, affordable, and a crowd pleaser… they also can be easily assembled at the last minute… or up to 2 hours before hand, leaving you more time to get ready or entertain your guests! 4-8 Oz of cheese… You can use fontina, asiago, gouda, parmesan, or even brie. 8-10 Oz of parmesan… again try use a decent one from italy. Fig Preserves… you can usually find this as “Dalmata fig spread” in most supermarkets… alternatively, you could use quince paste if you are feeling exotic. Arugala, preferably baby, to garnish. This recipe is super simple… First preheat the oven to 400. Slice bread into slices 1/4″ thick. drizzle in olive oil. spread on baking sheet. Grate 8-10 oz of parmesan cheese. sprinkle on toasts evenly… You don’t have to use all of the cheese if you want it to be less heavy. Bake for 10-15 minutes, or until cheese has melted and toasts are golden brown. Remove, and allow to cool. Cut your cheese of choice into 1/8″ fine slivers. they should not be longer than 1″. When you are about 2 hours away from service, or sooner, begin to assemble. Place a 1/2 tsp of fig spread or quince paste onto each toast. Then use half a slice of Prosciutto and try to place it on the toast to make it fluffed up and almost sculpture like. 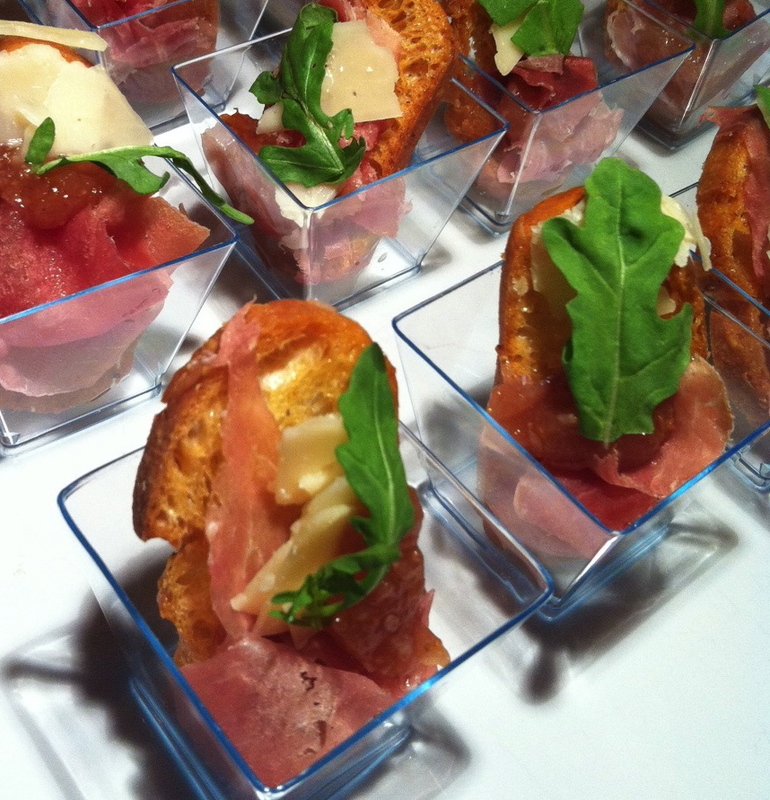 Insert a piece of cheese into a fold in the Prosciutto, then garnish with a baby arugala leaf. Repeat, and when you are done, serve! These always disappear first when I’m catering a party. bahaha i remember making A THOUSAND of these for the book party. …and now i want them again.